Good Morning! Remember when TGF had the 12 Days of Sketches last month? Well, this go 'round they are having a CHA Relay! I am so excited, knock on wood, I was actually able to upload my card in the Galleria! I hope I continue to have this good fortune when I upload Day 2's card. But I wanted to share my Day 1 card with you. Oooh, Mer Ian is truly fintastic! I kept the card pretty clean and simple. I colored Mer Ian with Copics. I used my good old trusty Creative Memories circle cutting system, but wanted to add more dimension like what is easily achieved with Nesties. 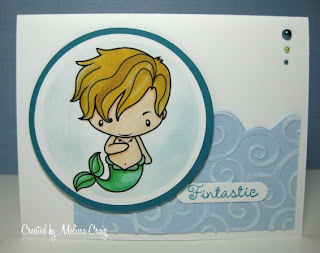 I don't have plain circle Nesties, so I cut a smaller circle (the blue blade) than what I cut Mer Ian (the green blade) using a scrap piece of card stock and then centered the stamped image behind the opening and applied the ink using a sponge. I removed my template and viola - instant Nestie technique without the die. Then using the red blade I created a mat using Taken with Teal. Then I ran a scrap piece of Bashful Blue through the Cuttlebug with the Swirls embossing folder. Before I adhered it I dragged SU! 's Whisper White Craft Ink over the swirls to give the look of foamy waves. I did this week's sketch from The Sweetest Thing. Added the sentiment from Down by the Pond and then added a few pearls. Cute! I hope to be back later today with Day 2 - it's an adorable Wild Sprout image! Super cute, Mel!! This relay challenge is so much fun!! Simply sweet Mel! Great CB waves, and we used the same sentiment on our Mer Ian cards. Love his coloring and faux nestie technique. :D Now on to day 3! I love this little mermaid guy! The swirls look great; adorable card!